This is what Jose Mourinho does. Not the prettiest victory you’ll see in this season’s Champions League, but incredibly effective. Inter reduced the game to a scrappy, stop-start battle, defended brilliantly from the front, and then pounced when Chelsea started to push forward. Mourinho’s tactics were essentially his standard ‘plan B’ he switched to in the first leg – a 4-3-3 (or perhaps a 4-2-1-3) that involves two forward players in wide roles, which had the effect of keeping Chelsea’s full-backs in defensive positions (whereas Mourinho’s favoured narrow 4-3-1-2 would have allowed Ivanovic and Zhirkov time on the ball). Ancelotti went for a 4-3-3 rather than a diamond from the outset, with Anelka and Malouda wide, and Mikel in the holding role. This site has often discussed the concept of ‘free’ players in midfield, attack or even at full-back. 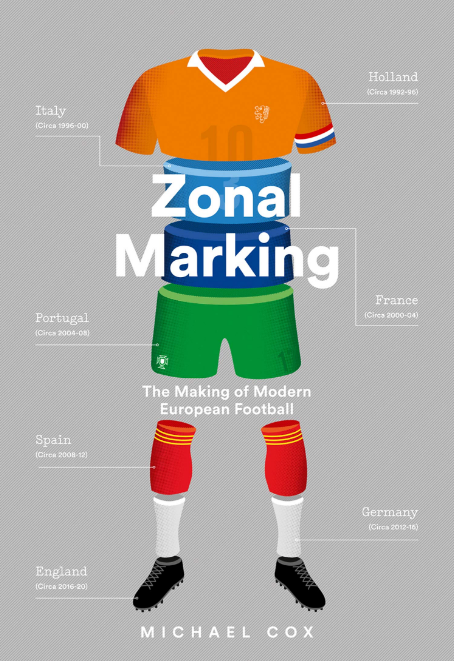 Whilst football has largely moved away from the classic system of man-marking in open play, it largely remains a game where you can identify key battles on the pitch. The most exciting, open football games often come where one side has a spare player in an offensive area of the pitch, or in the centre of midfield. This game featured no such players. Mourinho’s system was designed completely to make sure that every Chelsea player was ‘occupied’. 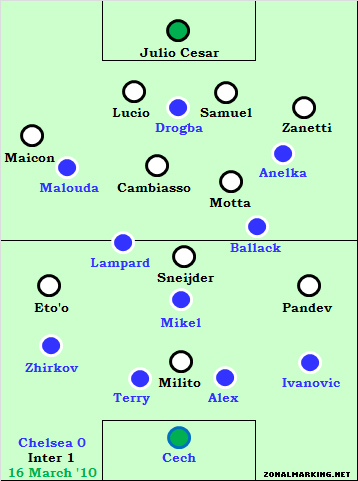 The use of two holding midfielders with one player ahead of them meant that Cambiasso and Motta were directly up against Ballack and Lampard, whilst Sneijder was in a position to worry Mikel. The two high wingers did the same against the Chelsea full-backs. This meant that the only ‘free’ player on either side was a centre-back. And given that none of Terry, Alex, Lucio or Samuel are particularly proficient passers of the ball, there was little creativity from either side. But this was probably what both managers wanted in the first-half, which led to the fairly dull spectacle in the opening 45 minutes. Mourinho would have been delighted with a 0-0, whilst Ancelotti generally looks to keep things tight early on in games he needs to win, making sure his team don’t concede a goal in the first half, before making offensive changes in the second. This was a hallmark of his successful European forays with Milan, and it seems to be his approach with Chelsea too, based upon tonight’s game. Ancelotti probably played this one right, in that respect. The obvious change to make for the second half was to change from a 4-3-3 to a diamond – getting Anelka further forward (he rarely seems comfortable in the outside-right position) and shifting Malouda into a midfield diamond to try and create an extra man in that area, at the risk of allowing Maicon and Zanetti further forward. He did this, but Chelsea still remained unable to create many chances. To stay in this competition, Chelsea had to score a goal, and they rarely looked like doing that. Ancelotti’s tactics are hard to fault, and yet Chelsea’s only goal in 180 minutes came from a weak shot that was fumbled in by Julio Cesar in the first leg. The questions should be asked of the Chelsea players tonight, who were up against a defensively brilliant side, but one that can be exposed against pace and trickery. What did Anelka contribute? Where were Lampard’s incisive passes? Does Michael Ballack ever do anything good in an attacking zone for Chelsea? A coach can organise and instruct his XI, but in the attacking third a side relies on some level of creativity from the flair players. There was very little in that respect from Chelsea’s front five tonight, and over the two legs they deserved to be beaten. A Mourinho masterclass? Perhaps, but you could have read the tactics from a mile off. His switch to 4-3-3 in the first leg indicated exactly how he thought it best to combat the threat from Chelsea, and he did exactly the same thing tonight. Indeed, it was a similar tactic to the one Sir Alex Ferguson favours in big games, as he showed against Milan last week. One benefit of this shape was that it meant Wesley Sneijder plays deeper than he does in a 4-3-1-2, and he saw a lot of the ball in the centre of midfield, constantly hitting sublime passes to the wingers – and it was no surprise that this is where the goal came from. Sneijder is a dream of a footballer and crucial to the way Inter play in either shape; he was the difference between the sides tonight in a game of little creativity – had he been on the Chelsea side, the scoreline could have been the other way around. Sneijder performed for Inter – Lampard and Ballack were anonymous for Chelsea. The only surprising thing was that Mourinho didn’t look to play Samuel Eto’o more centrally, considering the fact that Chelsea were playing an astonishingly high defensive line, and their centre-backs have been exposed recently against pacey players (see Carlos Tevez and Craig Bellamy’s goals in Chelsea’s previous defeat), but Eto’o pace eventually did lead to a goal anyway, when he moved to the left. Otherwise, Mourinho played it by the book, down to small details late on – the more defensively-aware Stankovic came on for Pandev when Chelsea put Malouda to left-back; Materazzi came on as a third centre-back in the final moments to assist when Alex was pushed forward into a makeshift forward role. A good victory for Mourinho, and probably a good one for the tournament. Europe is still yet to see the best of this Inter side, but tonight was a step in the right direction. I think Inter may now be the team Barcelona fear most in the Champions League, especially if they meet in the final. They know they can handle Man Utd and Arsenal. Bayern Munich and Lyon can be dangerous but Barca would fancy their chances over two legs against either of those two. Inter with Mourinho in charge is probably the game Guardiola wants to avoid….Inter have already shown this season they can nullify Barca over 90 mins. I think if Barca had to face Inter they’d prefer to do so in the quarters or semis, as they’ll have more chance to get the better of them over 180 mins. As a football purist, Barca vs Arsenal is the final I’d prefer. PS Do you know anywhere on UK TV I can watch the Benfica vs Marseille game on Thursday? I read your article on Benfica and would really like to watch them play. you can watch benfica here, on match day they will have some streams available. benfica is a quality side this season, who plays total football, very entertaining to watch, i still remember how they trashed everton 7-0 agg, but this game vs marselle away wont be easy, marselle has a decent team, its like a final for both teams, so i guess benfica wont play as they normaly do, they will probably play it safe, looking for an early goal then hold it and try to surprise marselle defense in counter attack for a killer. marselle is a team that also likes to keep the ball alot, playing at home, with quality players like lucho, ben arfa.. so it wont be an easy game for benfica. anything can happen. the 1st leg was 1-1 with marselle scoring a goal on the 90th min. I’m not so sure. Given, Barca would rather see a weaker team with weaker defence who they can take advantage of, but i wouldnt say they’d like to avoid inter because inter will have the upper hand rather just a higher hand than lyon or bayern will have. the 2-0 victory in the Nou camp was a fairly dominating affair and they did nothing that malaga didn’t when they were in the san siro. I wasnt happy with the left sided pairing which turned out to be ineffective on the night. The first game you had malouda and kalou on the left and they were so much more effective. when he made the switch and Chelsea got some things going down the left Inter scored the ties winning goal, i feel ancelotti was to cautious in the selection for the 2nd game. There really is no two ways around it. Mourinho is a fantastic tactician. And as an all round manager he is up there with the best. Whilst no one man can guarantee results, what he seems to do consistently more than any other manager is make the situation as favourable for himself as is feasibly possible. People could say if Chelsea had nicked the win then Mourinho would have got it wrong, but he wouldn’t have. He simply does everything he can to increase his odds of success. It’s taken a while for him to really get going at Inter (the league titles aside) but he has a well drilled side of top class players who could play for any of the top sides in Europe, playing how he wants them to. Done and done. The Champions league isn’t beyond him this year, but then… nothing ever really is. It didn’t help Chelsea’s cause that their entire right side was so ineffective — Ivanovic, Ballack and Anelka contributed little to no penetration or menace, allowing Inter to pour all their moves down the other flank without fear of being exposed on the counter. Neither Zhirkov (a more natural LM at club level as opposed to LB) nor Malouda did much tracking back, and that allowed Maicon to play his usual marauding role. Remember Man U’s win over Inter in the CL? Rooney and Park played all over Maicon’s flank to bottle him up and destroying Inter’s creativity from the back moving forward. It could have been so much different if Chelsea had done the same tonight. Thanks very much, that’s great to hear as that was essentially the idea for the website. No discussion of personalities, transfer rumours or boardroom battles, but just what happens on the pitch and nothing else. And yes, the comment section is going nicely, great to hear other people’s reaction to the game’s tactics. Why aren’t these articles signed? Bit cowardly. On that note, how many writers does the site have? Let me just echo the above. This website is absolutely brilliant. I wish I was as qualified to write with the same level of football intelligence but I am a mere amateur. O.K. this fawning is a bit much so I apologise but thanks for the brilliant writing on the site. agreed, this website is brilliant. It’s nice to see that there is still some quality football writing around with all the rubbish that newspaper hacks write. Can’t agree with you more. I’ve been so sick and tired of reading about the useless comments about how this team or that person deserved to lose “because he [or they] is a f*ckin’ wanker”. Your articles are what I really wanted to read about after the match. Superb, keep it up. And I appreciate how your readers are also adding their input and creating intellectual debate about football tactics. This site makes me wanna play Football Manager now. Absolutely agree that blame needs to go to the Chelsea players – in addition to the ones that you highlighted I would also add Mikel. Virtually all of Inter’s creativity stems from Sneijder – shut him down and you stifle the team. Ancelotti must have stressed this to his players (and Mikel in particular), yet time and time again he found space to utilise his fantastic range of passing. I don’t really agree with your conclusion that Ancelotti isn’t to blame. There was no plan B in Chelseas game last night, and a plan B is a must in cup ties on this level. Also changing Ballack for Cole was a big misstake. After Ballack went of there was a massive hole left on the right of Chelseas midfield. From there Sneijder and Eto’o created the goal and it was here Inter kept the ball to them selves during the final stretch of the game. Not saying keeping Ballack on would have meant Chelsea going through, but when a manager changes his players and tactics to the worse, he should be at least partially blamed. He had to gamble by making an attacking substitution, though. Yes, it didn’t really work and Chelsea ended up conceding, but they needed a goal. If they didn’t score, it was irrelevant how many goals they conceded. But Cole was the most natural player to come off the bench and try to win the game, and it was also natural to replace the ineffectual Ballack. If it was a league game, Chelsea would have got a draw as they wouldn’t have pushed forward so much. Also, there was a plan B – switching to the diamond in the second half. Ok, I see your point on the Ballack-Cole switch. As for plan B, even with a change in formation I never saw a change in the way they tried to break down Inters defensive line. Should have been clearer in my original post. Love the site by the way. Thanks. I do agree that Chelsea don’t have as many different ‘approches’ as they should. In particular I really think this squad is lacking an effective right-sided attacking player – Anelka isn’t comfortable there. But that’s an issue to be addressed in the next transfer window, I suspect. I beg to differ on the fact that Cole was the most natural player to come off the bench. Cole has been in absolutely terrible form of late and bringing him on was an act of desperation almost from Ancelotti. In the second half, Carlo switched to a 41212 with Ballack on the right side of the diamond and Malouda on the left. His substitution of Ballack for Cole meant that Joey had to be responsible for marking the surges of Zanetti down the left. A job at which he failed miserably. This meant, that Chelsea ceded control of midfield to Inter Milan and never looked like building up a strong attack to score in the rest of the game. Point to note is that up until that point, late first half, early second they atleast had a lot of the ball and looked to create chances. Who else would he have gone for, though. Sturridge? Inexperienced but I suppose his pace might have caused problems. But still, whilst Cole’s bad form is really quite sad to see, I think it was a fair move by Ancelotti. That said, he was poor when he came on, and I suspect that might be that as far as his Chelsea career goes. fair enough. I know that Cole looks like the rational solution, but since a 1-0 would have been enough for Chelsea, I think Carlo was too hasty withdrawing Ballack in the 62nd minute, considering the fact that it ran the risk of losing their (albeit light) handhold on the game. For me, Mikel out Cole in and a switch to a 442 or a 4222 should have been the way to go. And that too in the 70-80 minute bracket. I agree that this site is a long-awaited change from the usual football reporting which seems to focus on things like who will shake hands before a game, what colour scarf a player will wear after he returns to an old club, whether a manager will celebrate a goal when he returns to an old club etc. etc. lubo, I’m afraid any analysis of the current celtic side would just be depressing! ZM I thought Chlesea actually toyed with the diamond at times in the first half (whether this was CA’s instruction or no) with Malouda tucking in and Lampard pushing up. This led to Malouda dragging Maicon inside and some space opening up for Zhirkov, with Etoo reluctantly following. Inter defended this scenario differently in the second half: Maicon marked the right back “zone” and Cambiasso or Lucio picked up Malouda’s movement. I think that’s fair re: the diamond, although I wasn’t sure whether this was deliberate from Ancelotti, or if the natural tendencies of Malouda (midfielder) and Anelka (forward) were the main factor. Malouda probably should have been a bit deeper on the diagram. Re: Celtic, I must admit I don’t watch the SPL enough at the moment to comment in any great detail. I try and stick to the teams I know about, which is why the main emphasis here is on the Premiership and Serie A (I’m English but a big Calcio fan). The one thing I would say is I hope Celtic stick with Mowbray, who I think is a really good manager and probably will come good. As a fan I too rue the lack of Celtic on this pages, interesting to see some of the usernames here! One thing I can speculate about Mowbray is that his “plan B” that is often discussed on this site, is something I don’t really see in any other manager. To me he will sacrifice wingers in a 4-4-2 (with deep central midfield) in favour of strikers. So you’ll essentially see a 4-2-4 but seeing as the wide forwards still have the duties of wingers, the purpose is pretty much defeated and you’re sticking square pegs in round holes for the sake of an idealism to have MORE!! strikers on the pitch. Wingers play better as wingers than strikers, although there are obvious “blends” like Thierry Henry or Cristiano Ronaldo. But when we’re talking Diamansy Kamara forced into left-wing-forward or Georgios Samaras forced into left-wing-forward we really start to struggle. Another thing is, and I apologise for the thread-jack and will definitely stop now but Mowbray loves to sacrifice any old position for the sake of a striker – a full-back for example – and it nearly always unbalances the side. I try to avoid thread-jacking, so I’ll keep it short… I like Mowbray a lot but I can’t agree with ZM on this. I think he is stragegically and tactically poor: 2 symptoms stand out for me: 1) he has been consistently outsmarted by managers marshalling far weaker resources (the defeat by hibs where Hibs ’stole’ the midfield…) 2) there appears to be no thought given to the organiasation and execution of setpieces. ZM, I agree – I think it was Malouda’s natural tendency rather than Carlo’s instructions. However, what I thought was most interesting was Inter’s defensive response and how they effectively changed it to keep Maicon wide and going forward. Another example of how the use of fullbacks has become so key in the modern game. More generally, it was interesting to see how Inter seemed to mix zonal and man-marking systems in different scenarios – e.g. when Chelsea had the ball in deep positions Lucio followed Drogba quite high up the pitch and stepped up to contest the ball with him, yet when Chelsea had the ball in Inter’s third of the pitch, Lucio largely held his position and other players picked up Drogba if he drifted. I’d need to watch again to confirm, but that was certainly how I saw it in the game. The Lucio v Drogba scenario is quite common I think for a central defender. If far from goal and the striker is relatively isolated the defender will follow the striker dropping off and contest the ball/stop the attacker from turning/give a little foul to break up the attack. However if it’s nearer to goal and there are more opposing players around, stepping out of the line is riskier because it leaves a nice space to run into right in front of goal. Then it should fall to a midfielder to get in the face of the attacker before he can get his head up. Really glad I heard about this website last week.. already my favourite football-site by a distance. I agree with the assessment that the way Mourinho set his team up last night was nothing out the ordinary. Like you say, matching up like that meant Terry/Alex was the ‘free’ man and made it tough for Chelsea to break them down. I wonder if Carvalho could have made a difference there? What IS extraordinary is the reaction of most pundits that this was a Mourinho tactical masterstroke rather than a brilliant team effort. I particularly liked Phil McNulty on BBC website claiming Jose ’spooked’ Chelsea with such an attacking formation? Just because Pandev is nominally a striker doesn’t mean he played anything other than Left-Wing last night! As you point out, Ferguson (and even Benitez) would probably have lined up just as Mourinho did. 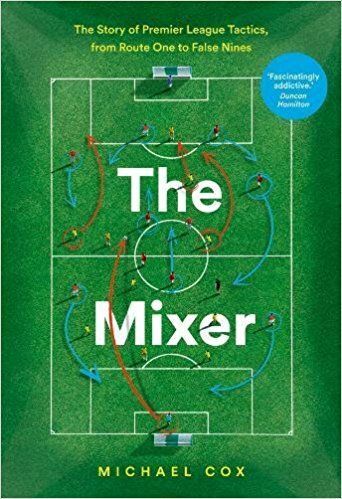 It was the same with Gareth Southgate on ITV in the first game – thinking that Mourinho’s switch to a 4-3-3 was an ‘attacking gamble’ when it was the complete opposite. God knows how he ’spooked’ Chelsea, considering it was the same formation (with I think one player different) that finished the first leg! Just when you think the mainstream media is about to discuss tactics, they fall back onto personalities…. Mourinho’s own comments that only an attacking strategy would work is shared by the Italian analysis I’ve read including the usual Mou eulogy from Sacchi: “The Portuguese coach is fantastic. He has changed the concept of Italian football,” he wrote in La Gazzetta Dello Sport. “We have always been used to closing ourselves in heroic defences to then trust the counter-attack. But remember, it was an offense-minded line-up; wingers, whether they be reconverted strikers or natural outside forwards, are still forwards. When Inter had the ball Etoo and Pandev would press right up against the full-backs and almost level with the centre-forward Milito. And of course, since this was an away tie against a formidable opponent Mourinho asked Lucio and Samuel to play a deeper line- so in that sense it wasn’t as gung-ho as Ajax ‘95, current Barcelona or the Chile of today. And yes, the Inter outside-forwards were expected closer to the midfield (forming a 4-2-3-1)whenever Chelsea were in posession. But this is standard practice for all teams who play an adventurous 4-3-3: Pedro, Messi and Henry are expected to do this as well. Besides, this line of 3 is a relatively higher line of pressure than the one typically formed by the wide-men in a 4-4-2, who are obliged to double all the way back to their own full-backs. Mourinho, like Capello, is neither defense-biased nor offense-biased by inclination; he’s a ruthless opportunist in the tactical sense, and if his opponents’ weaknesses can be exploited by a more aggressive attacking line-up, he will adopt that. Great website guys. It is refreshing reading something that deals with tactics in an informed and interesting manner. All of the talk last night was how ‘attacking’ Inter were in their formation, yet you have shown that it was the exact opposite, this was a classic Jose Mourinho performance: Every player working hard defensively and maintaining their shape whilst hitting the opponent on the break. A question: Has Mourinho been changed tactically by his time in Italy or as he kept the same ideas and tactics throughout his time with Inter? I think the system he uses at Inter this season is relatively similar to his time at Porto and Chelsea. Primarily a 4-3-1-2 (as at Porto) but often reverts to 4-3-3 (which he used a lot at Chelsea). But switching between those systems was his hallmark at Chelsea and it’s continued with Inter. He never plays anything other than a back four, and rarely plays anything other than three central midfielders, it’s just a case of whether he has two wide players and a forward ahead, or a ‘trequartista’ and two forwards. But this is almost an entirely different Inter side in the attacking third to the one he had last year. 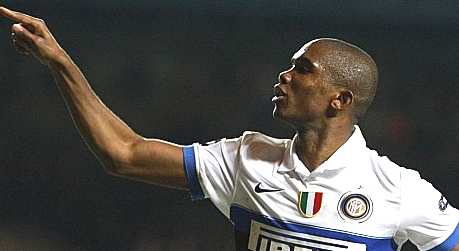 The furthest forward five players last night – Diego Milito, Goran Pandev, Samuel Eto’o, Wesley Sneijder and Thiago Motta – are all in their first seasons at the club. I’m interested in the disdain here for British personality led journalism and the contrast with say, the more technical, tactical Italian version, it’s something frequently commented on by Mourinho himself. He mocks Italians for their obsession with tactics, wondering aloud what qualifies them to comment on the subject, and stresses the primary importance of personality and attitude. Maybe this is self-serving but he’s always been consistent on it. Yes, it’s an interesting view of his. But before he went to Italy he spoke many times of how exciting and interesting he found the nature of the tactical game i nSerie A and by Italian clubs in Europe. I remember of him speaking of when he came up against Lazio in the UEFA Cup with Porto, and he was amazed how quickly they were able to shift and adapt their system throughout the game, from a 3-5-2 to a 4-3-3 (if I recall correctly). When he went he seemed really excited about just how tactical the Italian game was. But if he considers this to be the case, it’s slightly surprising that he mocks the Italian newspapers for reflecting this in their coverage. Even if the newspapers aren’t qualified to comment, I still find the nature of their coverage much preferable to British sports journalism. La Gazzetta dello Sport is so diagram- and stat- based that you can almost enjoy it without speaking Italian! Of course we should remember that we aren’t as qualified to talk about tactics as Mourinho, or pretty much any other top-level manager. This site tries not to criticize managers too much – it’s easy to be wise in hindsight. The lack of knee-jerk manager bashing is another positive of this site. And yes Mou is one of those coaches whose face lights up when the subject of tactics comes up, but I think the tactical scrutiny added to what they call the ‘contorno’ – the hysteria and controversy surrounding every decision there – wears him down. Also that everyone in Italy considers themselves an authority on the subject leading to a lack of respect for his decisions and achievements, hence his defensiveness and chippiness. But he was like that in England too to be fair. And Terry and Alex are decent passers, especially their long-range accuracy – remember Terry’s pass to set up A.Cole’s goal against Sunderland? Terry and Alex may be good passers of the ball but are they comfortable enough to step into midfield to make the extra man count? Carvalho would have been, Lucio is on the other side of the pitch as well. Mourinho as always makes sure he does the best he can with the cards he is dealt. I just wouldn’t have called his formation a 4-3-3. Pandev and Eto spent most of the first half in line with Sneijder, it looked very much a 4-2-3-1 to me. Sneijder is a class player, a player as has been said would have been a great asset to that lopsided Real, thank goodness they didn’t see it that way. As a United fan I wonder what the way this game panned out means for a possible game against Inter and the league game against Chelsea. Fergie will likely set up shop in a similar way and will have two pacier wide men, although Chelsea may be able to exert more power in the middle of the park. Good article as always and having followed your analysis of the first leg, this game was unsurprising in its tactics and outcome. Chelsea needed a moment of brilliance from an attacking player and it did not come. Great Site ! Trying to go through all your previous posts. Really Love this site! Can’t believe finally I found a great site which has intelligent discussion about football. Great Job! second that, i really like this site!! Mourinho’s tactics, while initially seeming defensive, actually added great attacking space and shape to Inter. Both Ivanovic and Zhirkov were so pre-occupied with Pandev and Eto’o in the first half that they were being constantly dragged out of position when the two attackers shifted into a more central role when play had got past the half way line. This gave Zanetti and Maicon (especially) acres of space on either flank to try and get crosses in for the now 3 strikers who were lurking in and around the box. This was extremely prevelant in the first half when time after time, Motta/Cambiasso/Sneijder would dink the ball into space for the full backs to run into. If you remember, the fantastic Eto’o headed chance came in the first half when this exact scenario occurred. All in all, a simply sensational tactical performance from Mourinho, but more importantly the players on the pitch – with every one of them having a key role to play in the victory. WOW, ZM, great analysis. This pretty much sums up what I thought I was thinking while watching the game, but I definitely could not have put it quite as eleqouently (I think I spelled that right). I think that Lucio and Samuel played the game of their lives, running around and blocking shots left and right. Samuel also did a great job of frustrating Drogba. Maicon basically owned Malouda, using his strenght to basically shove him off the ball everytime he got close. Anelka brought about his own demise, mostly (as you pointed out) because he is not comfortable on the right. As an avid Barca follower, I definitely thought Inter were a weak team, mostly due to the fact that Barcelona literally DESTROYED Inter in Camp Nou with Tiki Taka football. They shut down Sneijder, which destroyed all Inter’s creativity, and basically made the team chase the ball around for 90 minutes. Game ended up 2-0, but it could have been worst. After watching Inter vs Chelsea, I can definitely see Inter’s strenght is againts big physical sides. Sneijder didn’t play in that game and, if I remember correctly, Mourinho said that his absence in that game was comparatively bigger blow to Inter than Messi and Ibrahimovic injuries were to Barcelona. After watching last night’s game one could argue he was right. yeh, Samuel and Lucio are playing well together. Inter are a good team but Barca would possibily be their downfall. Small, quick players that Barca have doesnt suit Inter as seen at Nou Camp. If they meet in final it will be interesting. Chelsea need a few new youthful players. get rid of Ballack and Mikel. One note about your CB analysis. Lucio may not be a great long passer, but he has other qualities that make him very useful as that free x-factor. He has ball control, pace and vision to spot a gap – abilities that many wingers would be proud of. There are many Serie A games in which he functions as an extra midfielder when the team needs to push forward. Against Chelsea, he curbed his enthusiasm because Mourinho would have buried him alive if he had gone off on a run and left a gap behind for Drogba to exploit. I agree that Ancelotti got it right, in that he played it tight until the match got into the ‘killing zone’ at the end where whoever scored next was likely to progress. Also agree he was hampered by the absence of Ashley Cole, who is the only player in the squad who could have taken the game to Maicon. That Chelsea’s high line came undone should have been no surprise after Milito nearly sprung it a couple of times in the first half. Schneijder’s pass was the moment Inter had been waiting for, but it was an amazing pass, he knew where it was going a long time before he got the ball. Yeah I think that’s a great comment you make about Joe Cole, Ancelotti just doesn’t seem to trust him as either a central player or a wide player. Cole’s best form came playing on the wing, but Ancelotti just doesn’t seem to like players like that. Very good point PC about the free reign players for Ancelotti. Joe Cole is one of the most talented players of recent years and on a personal level i’m adamant that he should go to the world cup. If Ancelotti doesn’t trust him then evidently he won’t. The point you make about Gourcuff is spot on as well and was a decision I never understood. In fact watching Milan last season Ancelotti failed to trust Ronaldinho there and only since Leonardo came in has Ronaldinho become a key fixture in the side and recovered anywhere near close to the form he once had. Ancelloti clearly does not trust these players. Fantastic observation. i must say i like this site a lot.i personally think that anceloti must shoulder the blame for what went wrong. taking off ballack and bringing in joe cole is not too bad,but i think the way the game was progressing,the holding midfield position role should revert to deep prompting/attacking position which ballack normally offers you more from there. if you need to win a match were your fullbacks are contained and your prime stricker is been contained,you need to allow an unmarked athletic central midfielder to come in as a spare man. Agree about the website. It is such a refreshing change from the hack journos and blogs spouting off cliches and generalizations. Predictions are made from these people based on which team has the best individuals. If you tallied up the games Chelsea was predicted to win last season by Sky’s team they would total around 110 points! Football is a game of problems and solutions. Every problem can be solved considering that the players are all of the highest calibre, it is just a matter of finding that solution. Hehe, well done! Keep it up! And here is a beautiful, beautiful example of it all going wrong for the central defender. Tomasson has dropped off and wide taking the Sampdoria central defender with him but Serginho’s fantastic run has turned his head just as Tomasson finds a yard of space. The defender gives up on Tomasson and tries to cover Serginho, but ‘Concorde’ has already left him for dead. Shevchenko finishes the job in the channel Tomasson’s defender should have been in. One of my all time favourite goals. I’m normally (like many on here) not concerned with the issues behind the scenes. But regarding Mourinho’s recent comments about Italian football (that he doesn’t like it, and it doesn’t like him), it is rather interesting to see him come back to England. Whilst the man is without question a character, who adds so much to the game in personality, his tactics are just fascinating. I suspect upon coming back over here we may see a new formation or different varation that he will have looked at whilst in Italy but not implemented yet in that Inter side.